Welcome to the SDrv forum, a forum for discussions about the CS SDrv SD slot power driver utility and it's applications. Questions, feedback, tips, stories about how you use SDrv, what have you. No wires, no brick, nothing. Just an extended SD card you can leave in your pocket, and it has a microSD slot in it, so you can still use a 2Gb card and your Treo at the same time. I'm working with Spectec's team the last few weeks to find the way to make SDG-812 GPS work on TREO 650. They introduce me CS SDrv. After short tests I figured out that this application only keeps host controller clocking SD card when it's running. I was hoping that this application would to be able to open this Slot Driver restriction that avoid TREO's users to use SDIO devices on it, like SD WiFi, SD GPS, etc... Without a SD card on SDG-812 slot, this application doesn't work. The TREO models have a slot driver named MMCBulverdeIntelDrv_Device.prc that manage its SD slot. I spoke with a Palm's technician who told me that's possible to set this driver on "perpetual power mode", but he couldn't offer me a new driver with this feature. Once your company is dealing with Spectec, I suggest you to look carefully this issue from your application. 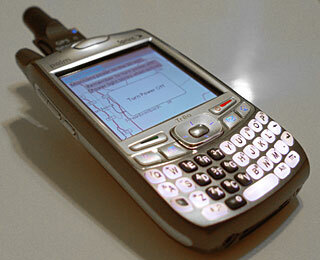 The Palm TREO is the most popular smartphone and I guess that it is a good market to work for. CS SDrv is specifically designed to address to power issue on the SD slot. While this works well, we are looking into eliminating the storage card requirement next. CS SDrv works fine on the Treo 650, (Zire 72, etc,) in that it does it's job and manages power to the SD slot. However we have reports that the SDG-812 has issues talking to Bluetooth 1.1/1.2 devices. You may want to investigate that angle as well. Certainly it's a great GPS and we've interested in enabling it for all Palm devices. Please, let me know when you have a new version from CS SDrv. Just ordered and received my reg code for CSDrv and looking forward to getting my new GPS unit. Been using TomTom6 and a bluetooth GPS for the last 6 months on my 650 and am really looking forward to my new toy (SDG-812) as it will make working with my routes much easier as I always forget to bring the darn bluetooth adapter back in the apartment and whenever I need it the battery is dead. I bought your program without testing first for the simple reason that a friend of mine uses your CSOnline to work on the train everyday with his Treo 650, and swears by your company. I'm sure I'll either have questions or comments soon! Just wanted to let everyone know the CSDrv works great with the Spectec 812 and both Tomtom and Mapopolis. I got to use it for almost 24 hours. Got out of the car this afternoon after testing tomtom's route home, and dropped the treo. <Laugh> The Treo is fine but the 812 is in a dozen peices. Be a while before I can replace. Boy I have great luck sometimes. shighfield has SDG-812 work on Treo650, could it possibly work on Treo680 as well? I am also wondering, with CS SDrv, could I use those SDIO wireless card for my Treo680? We haven't tried it with a 680 in-house, but there's no reason it shouldn't work. Perhaps someone with a 680 will add their comments. If you have access to a SDG-812, you can of course just try CS SDrv, since it installs as a free trial. I'm trying to get an ey-fi card to run on my Zire 72 using CS Sdr. Hasn't worked yet. Any thoughts/experiences? We don't have an Eye-Fi here, so we have no experience with this unit. However that's a very interesting idea! And it does stand to reason that the Eye-Fi part would have the same problems with Palm power-down that the SD GPS's have, and that CS SDrv should address that. Does the Eye-Fi draw more power than other SD devices? It's certainly a slick device, but it's hard to imagine how they can transmit WiFi signals without drawing more power than a typical SD card. It may be that the Palm simply can't provide enough power. Or the signal may be there but very weak. It appears we're not the first ones to wonder about this - check out this link. I'll attempt overclocking the Zire's camera next (using PXA Clocker).